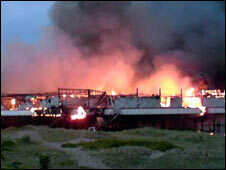 Arsonists may have started the fire which has destroyed the historic Fleetwood pier, built in 1910. The blaze started in the early hours of Tuesday at the derelict pier and had taken hold when fire crews arrived. Lancashire Police are treating the area as a crime scene while investigations take place. Kyran Ronson, chief fire officer at the scene, said arson was a "possibility" but that an electrical cause could not be ruled out. Lancashire Fire and Rescue Service sent 10 fire engines, a major incident support unit, a mobile fire station and two aerial ladder platforms to the scene. The fire is believed to have started near the front of the pier by a former pub and cafe. Cathy Stacey from Lancashire Fire and Rescue Service said: "Most of the pier has been destroyed - certainly the buildings on it. "The concrete structure that forms the base of the pier is still intact and the metal supporting beams." Around 90 firefighters battled the blaze which, at its height, reached 40ft (12.1m) into the air. Kyran Ronson, chief officer in charge of the incident for Lancashire Fire and Rescue service, said: "Arson is a possibility. It can't be ruled out. "It could also be an electrical fire and might have been smouldering for hours." Sheila Grace, 60, was born in Fleetwood and owns the nearby Sandpipers Hotel on the Esplanade. She said: "I know things have changed, but it was the jewel in Fleetwood's crown, everybody headed there and everybody knew it, and in the last few years it has been just nothing." 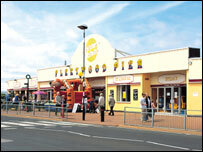 The pier was bought by local businessman comedian Mike Simmons, whose stage name is Joey Blower, for £500,000. He planned to turn it into flats, but faced local opposition. Mr Simmons told the BBC that the figure he bought the pier for was the level of investment he had in it and would now "explore all avenues" for its future. Wyre Borough Council leader Russell Forsyth said: "It is devastating to see what has happened, but thankfully there was no loss of life, which is always the first consideration." Fleetwood Pier was rebuilt in 1953 after being damaged by a fire in 1952. The blaze on 25 August 1952 started in the cinema and created an inferno that could be seen from 20 miles away. The attraction was first built in 1910 - the last to be constructed in the "golden age" of pier building, from 1860 to 1910. It was built with a promenade deck and 600ft long jetty with an ornate oriental-style pavilion, which opened to the public in 1911. The pier continued to remain profitable throughout the declining years of the seaside resort, even receiving a £70,000 facelift in 1972. But in recent years it has gone through changes of ownership and uncertainty over its future. 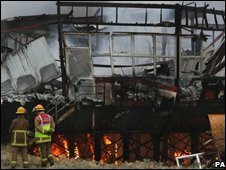 The blaze comes less than six weeks after a fire destroyed the 104-year-old pier in the Somerset resort of Weston-super-Mare.